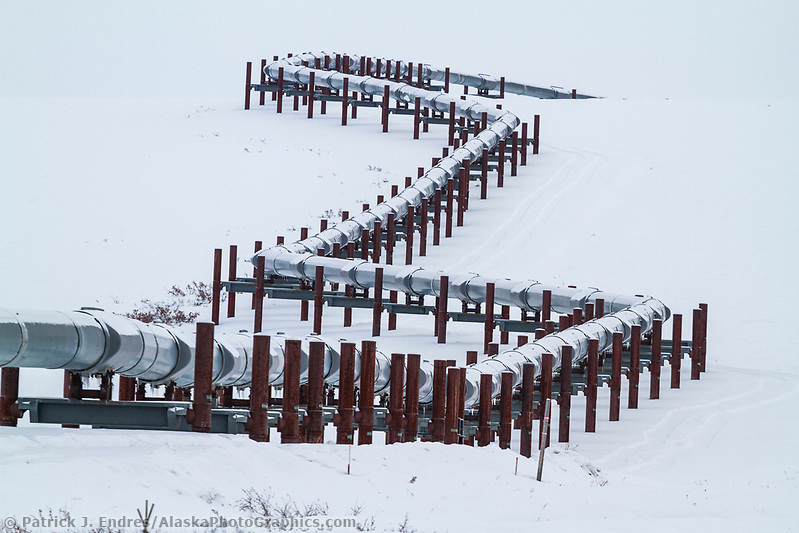 Trans Alaska oil pipeline photos and information about its construction. 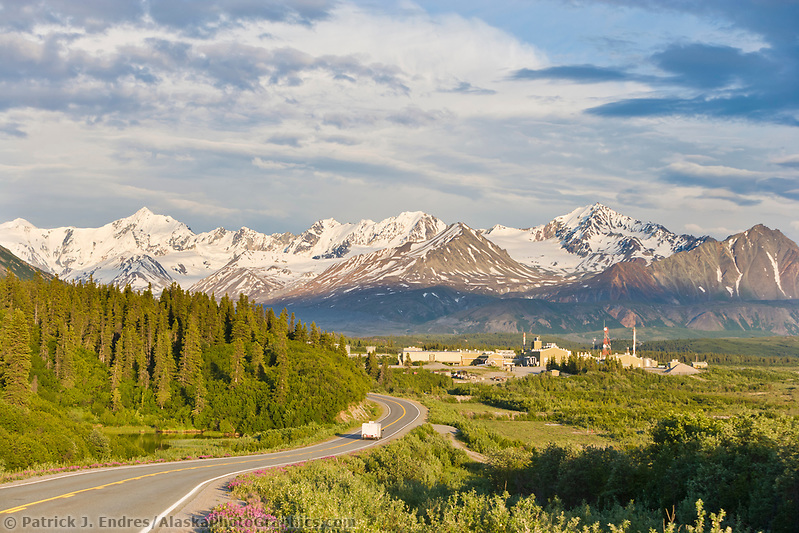 The Alaska oil pipeline extends 800 miles from the north coast of the Arctic Ocean south to the coastal waters of Prince William Sound in the town of Valdez. 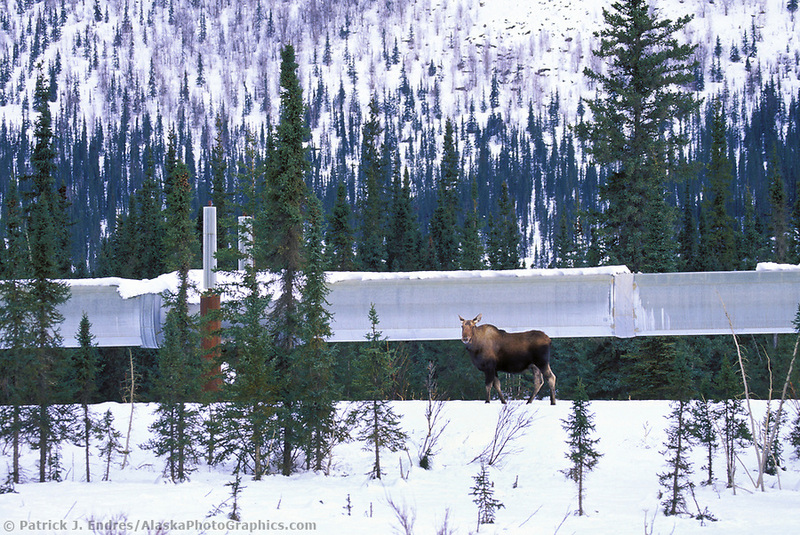 It traverses tundra, rivers, streams and rugged mountain passes, standing the test of time as a true engineering feat. 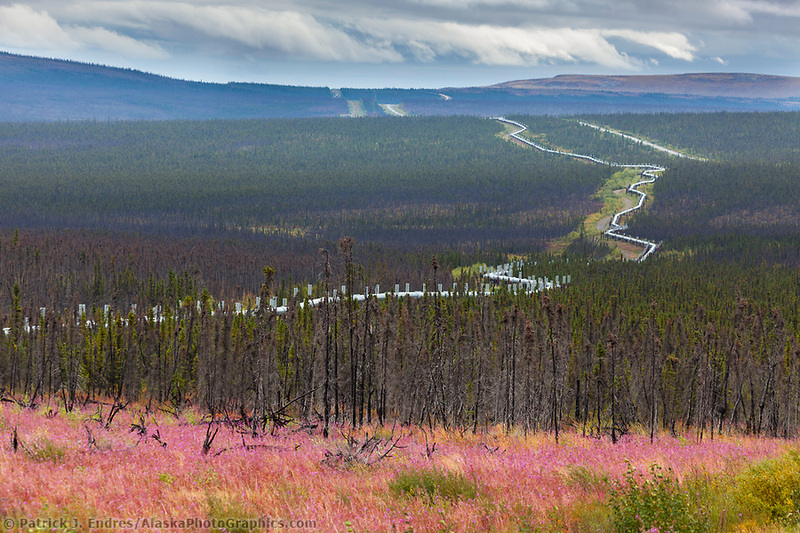 I have hundreds of trans Alaska oil pipeline photos, covering the diversity of terrain through which it passes. 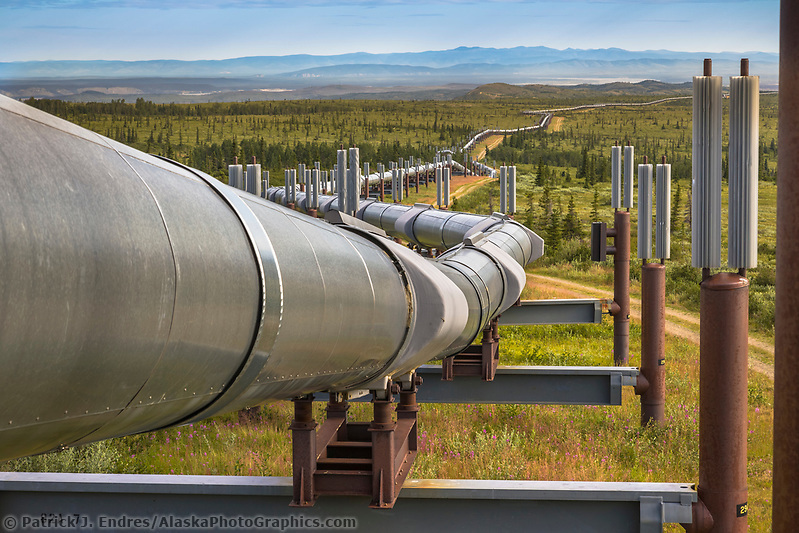 All the trans Alaska oil pipeline photos on this site are available for licensing as stock photos for commercial use or for purchase as fine art display prints for your home and office decor. Photos may be purchased and downloaded through this website by clicking on the photos or following the links to galleries. 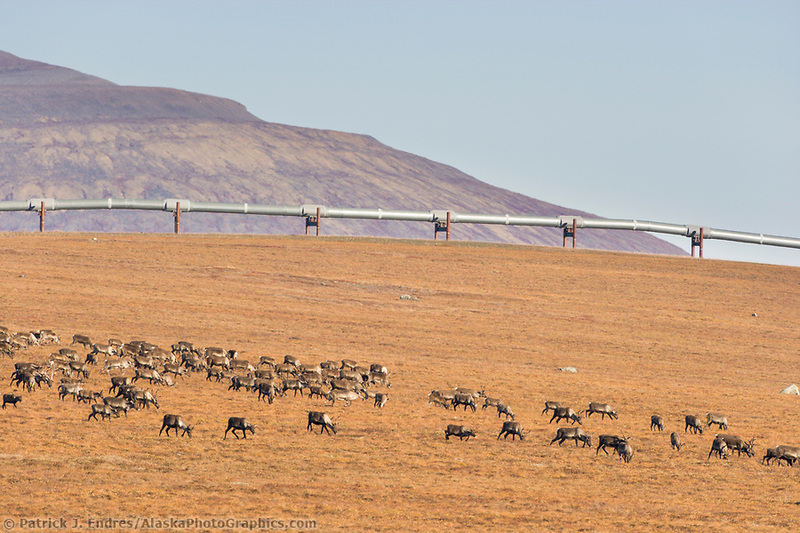 The pipeline was purposely raised high off the ground in places to either span rivers or to allow wildlife to cross beneath the pipe. Oil was discovered at Prudhoe Bay, Alaska in 1968 after explorers had been searching since the 1950s all through Northern Alaska. 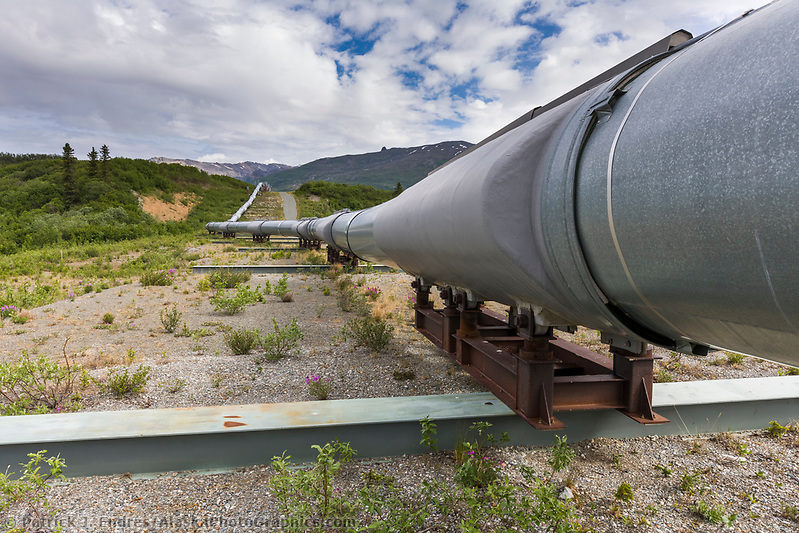 A pipeline was considered the only viable system for transporting the oil to the nearest ice-free port, almost 800 miles (1,300 km) away at Valdez. 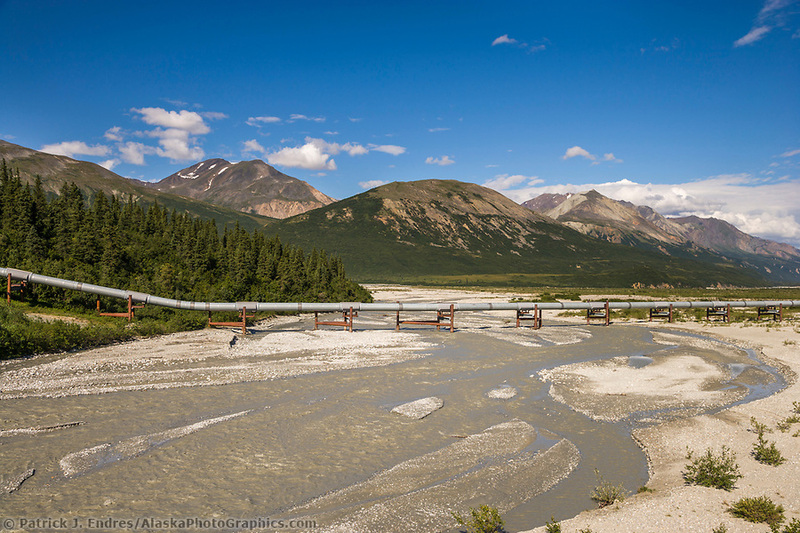 Completed in 1977, the Alaska pipeline covers 800 miles of mountain, muskeg and river valleys in its span from Prudhoe Bay to Valdez. Stretch the pipeline over the Lower 48 and it would reach from Los Angeles to Denver. The pipe is a tube of 1/2-inch thick steel with a diameter of 48 inches. It looks thicker from the highway because the steel pipe is wrapped with four inches of fiberglass insulation. The shiny wrapping we see is a coat of aluminum sheet metal. The closer oil is to the molten core of the earth, the hotter it is when oil companies pull it to the surface. 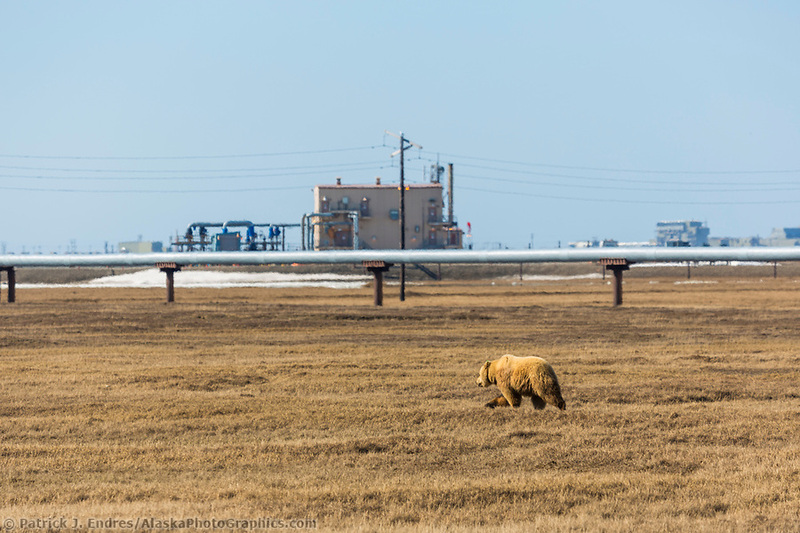 Oil pumped from the Prudhoe Bay field, which is 10,000-to-20,000 feet deep, is about 145 to 180 degrees Fahrenheit. Using heat exchangers that work like a car’s radiator, the oil is cooled to about 120 degrees before it enters the pipeline. The temperature within the pipeline is relatively constant despite variation in ambient temperatures along the line. The temperatures can range from nearly 100 above to 80 below Fahrenheit, which is the Alaska record cold temperature set on Jan. 23, 1971 at Prospect Creek Camp on the Dalton Highway. 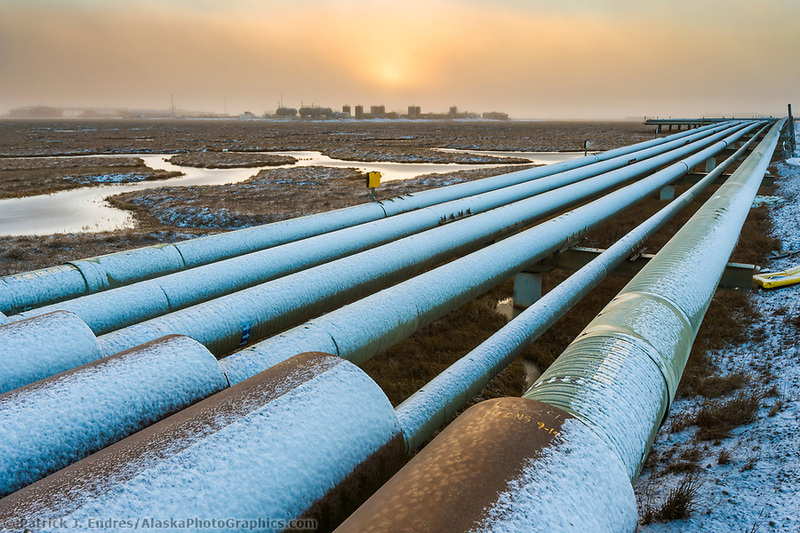 The four inches of fiberglass insulation that surrounds the above-ground pipeline keeps the oil warm enough to flow even on the coldest winter days. If the pipeline had to be shut down in the winter, the oil within could sit for several months before congealing. Engineers would have buried the entire pipeline had it not been for permafrost (permanently frozen soil) lying in sheets and wedges beneath the surface. 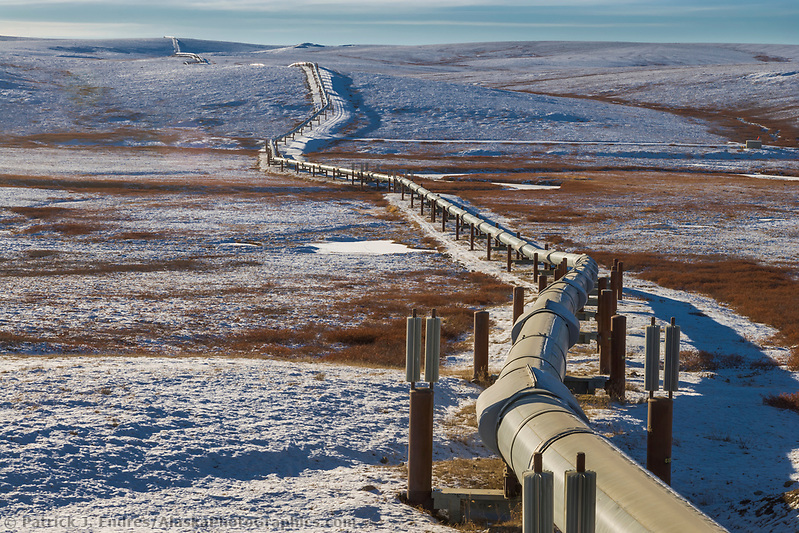 The pipeline couldn’t be buried in permafrost because the heat of the oil would cause the icy soil to melt. The pipe would then sag, and possibly leak. 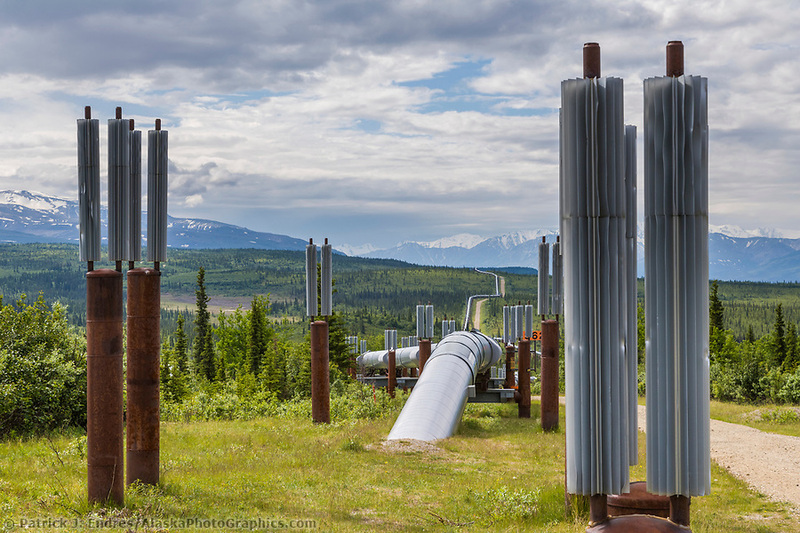 Because much of Alaska is underlain with permafrost, Alyeska routed just over half the pipeline above ground. 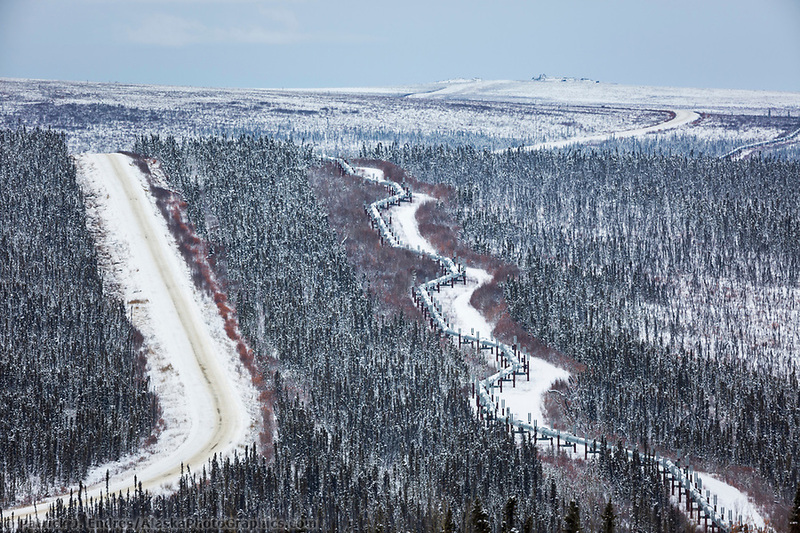 Where it snakes over land, the pipeline is supported by posts designed to keep permafrost frozen. Topped with fan-like aluminum radiators, the posts radiate heat from the ground into the cold winter air to keep the soil solidly frozen. When the air temperature is 40 below, for example, the posts cool down to 40 below and take away heat from the soil, assuring the ground stays frozen. The pipeline was built in a zigzag pattern to allow the pipe to expand and contract. Because workers welded much of the pipeline at temperatures well below zero, engineers anticipated that the metal would expand once-hot oil began flowing through. The zigzag also allows the pipeline to flex during earthquakes; it slides over H-shaped supports with the aid of Teflon-coated “shoes” that stand on the crossbar between the posts holding up the pipeline. 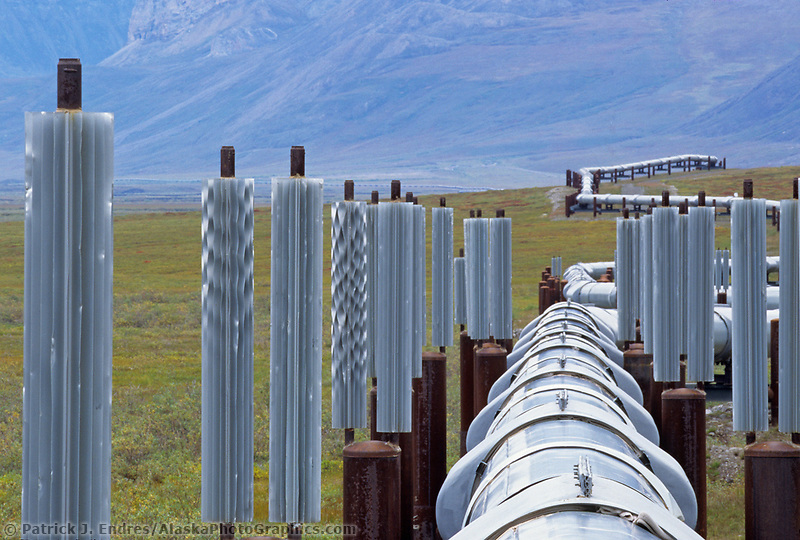 Where the pipeline crosses seismic faults–weak areas of rock that rupture during earthquakes when the plates of the earth grind against one another–it sits on rails. 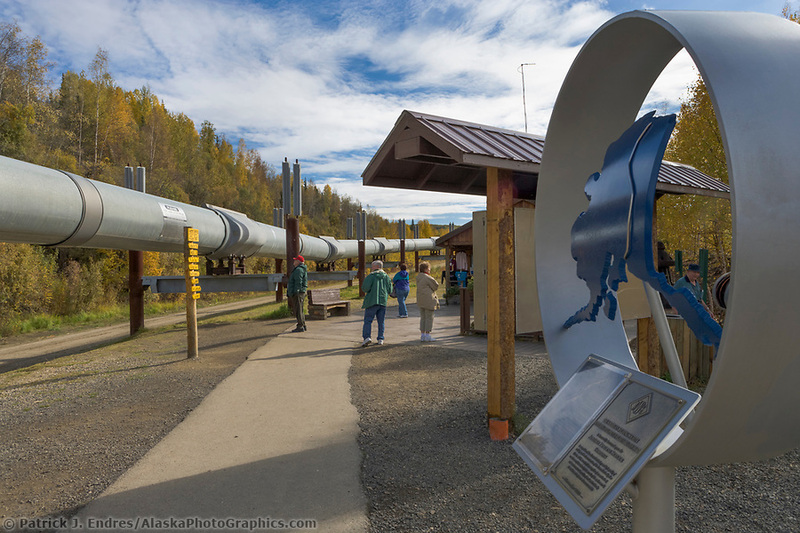 Near the Denali Fault south of Delta Junction, the pipeline rests on 20-foot steel bars that allow it to move side-to-side should an earthquake cause the earth’s crust to slip laterally along a fault line. Powered by the heartbeat of 10 pump stations, oil flows through the pipeline at about the speed the Yukon River carries a raft-about 5 to 7 miles per hour. 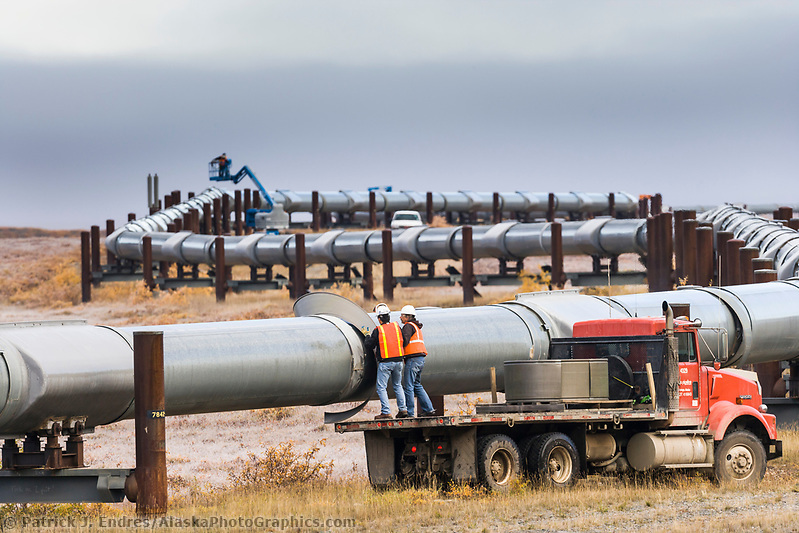 At that rate, it takes about five-and-one-half days for oil to complete the journey from Prudhoe Bay to Valdez. 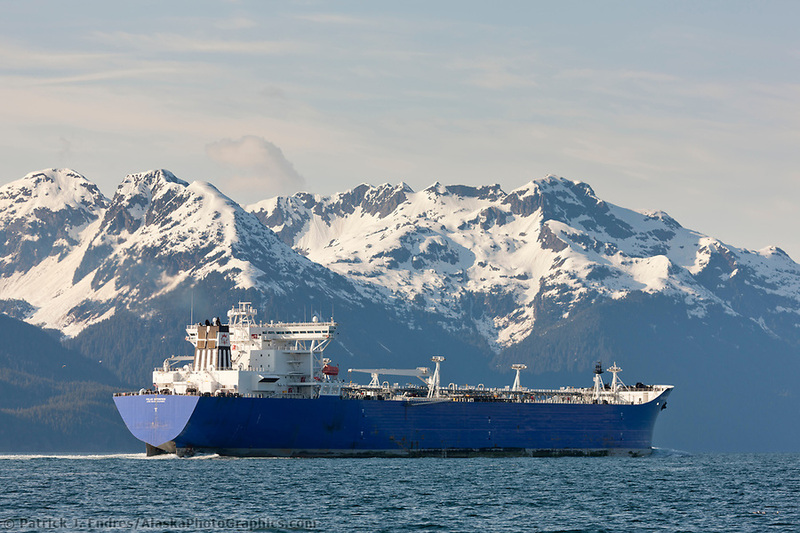 Once the oil reaches the terminus in Valdez, it is loaded onto tankers and transported through Prince William Sound. On March 24, 1989, the oil tanker Exxon Valdez grounded on Bligh Reef in Alaska’s Prince William Sound, rupturing its hull and spilling nearly 11 million gallons of Prudhoe Bay crude oil into the pristine waters of the Sound. 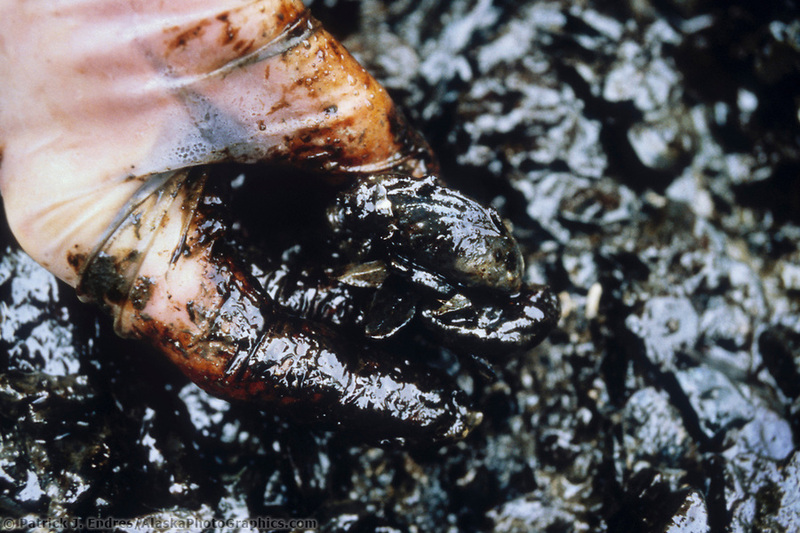 By volume, the Exxon Valdez oil spill is the second largest in US waters, after the 2010 Deepwater Horizon. Prince William Sound’s remote location made response efforts difficult. Whipped up by a wind storm, the oil spread widely ravaging the ocean life, and its toxicity killed many ocean organisms, birds, marine mammals, and wildlife. The oil eventually covered 1,300 miles (2,100 km) of coastline and 11,000 square miles (28,000 km2) of ocean. 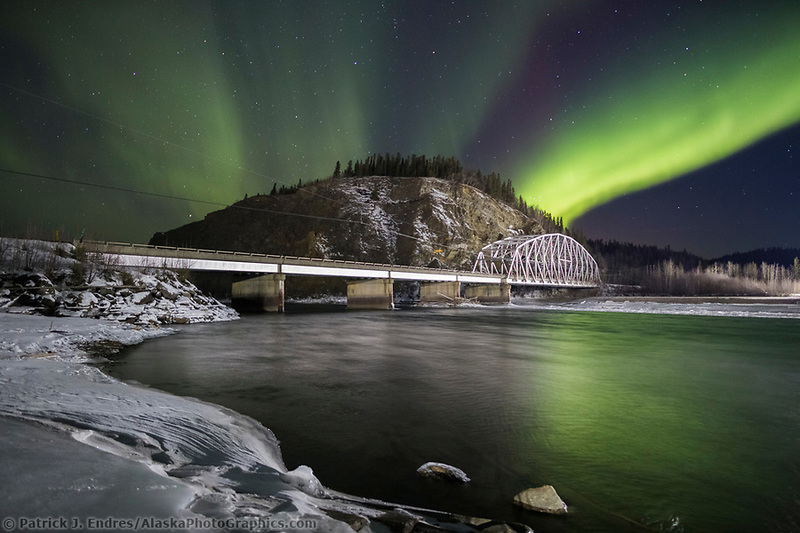 This article is provided as a public service by the Geophysical Institute, University of Alaska Fairbanks, in cooperation with the UAF research community & the aid of Alyeska Pipeline Service Company’s Elden Johnson. Ned Rozell is a science writer at the institute.